Grilled Fish Tacos are absolutely one of my favorite things to make and eat ever! I can think of no better way to kick off my 100th post, then by share my special Grilled Fish Tacos with Tomato-Green Onion Salsa with you. I use Halibut in these tacos, it is my favorite fish and has a delicious non-fishy flavor. Halibut can be a little pricy, unless you are fortunate enough to live near the fishery. Any white fish will work well with this recipe, tilapia or cod would be a good option. 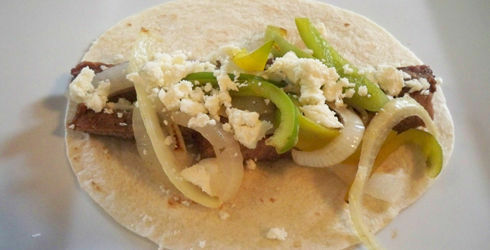 Carne Asada Recipe: Carne Asada is a roasted beef dish, that literally means “roasted meat”. Carne Asada is typically made with thin slices of marinated meat, that is grilled and used in tacos and burritos. This recipe is slightly different. By using a beef round roast and cooking it in the oven for 3 hours, you get a super flavorful, moist beef that pulls apart easily for perfect taco sized portions. Although this Carne Asada takes 3 hours to cook, it is extremely easy to prepare. The green salsa complements the Carne Asada very well, and it adds a nice color to the dish. Our family loves the crunchy cabbage in our tacos, but, if your not too sure about using cabbage then substitute with lettuce. Also, you can use just soft tacos or pre-made hard tacos if you like. Next time taco night rolls around at your house, try this recipe instead of the typical seasoned ground beef tacos. With company over this weekend I’ve had plenty of opportunity to put my recipes to the test. This grilled corn salsa is the prefect mid-day snack to keep everyone happy between meals. 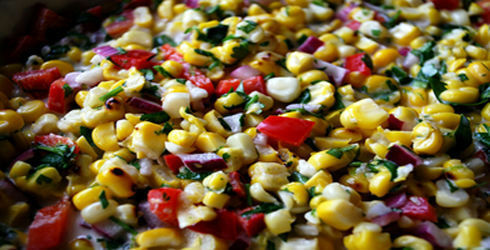 Grilled Corn Salsa is similar to texas caviar, except it is sauteed, and does not have beans in it. This is a sweeter salsa, and the grilled corn adds a nice smoky flavor to contrast. I severed it with tortilla chips like a traditional salsa, but it would also be fabulous served along with fish, or even as a relish on burgers. My husband also likes to eat it all by itself as a side dish with meals. Grilled Fajitas are one of my husbands favorite things to eat. They are easy to make and taste amazing, perfect for a family of four or two. Don’t let the Barbecue in the title throw you off, it is not talking about the saucy, messy barbecue. Using the barbecue spice rub on the sirloin and grilling it adds a delicious subtle flavor that totally enhances the Fajitas. This is a wonderful Grilled Corn Salad that appears in our house every summer when corn is super sweet and in season. Grilled Corn Salad really showcases what summer corn is all about. Sure, you could add some tomatoes, avocados, and other vegetables that are in season, but I like to keep this simple. This dish will complement any summer outing and will last the test of time. You can transform this Salad into many different things, a salsa on your burrito, or made more complex with some additional ingredients (I like avocado if you have one). Delightfully delicate these Sweet Potato Pancakes are permeating with the enticing aroma of lemon, these deep golden-brown, thin pancakes are moist inside with crisp edges. For breakfast, serve them plain or with butter or maple syrup. For lunch or supper, top the Sweet Potato Pancakes with sour cream and put a chunky salsa on the side. For dessert, serve at room temperature drizzled with equal parts of lemon juice and honey stirred together and top with freshly whipped cream. For another simple lemon syrup, stir together 2 tablespoons of fresh lemon juice and 1/2 cup of pure maple syrup. For ease of cooking, combine the wet ingredients in a 1-quart measuring cup with a pouring lip, stir in the dry ingredients, and then pour the batter directly onto the hot skillet. Pantry List: Having basic cooking ingredients at home saves time and makes it easier to eat well day in, day out. With a well-stocked pantry, you can whip up creative meals with items on hand and shorten your shopping list when preparing a complicated meal. Consider buying pantry items in bulk from a reliable local store where stock rotation ensures the freshness of food. That way you get the quality and quantity you want and you’ll save money and consume less packaging. The staples below are suggestions of foods good to keep on hand. I certainly do not stock them all, just the things that I use most regularly. I hope you’ll use the list for inspiration and as a reminder when it’s time to shop for food. Barley, bulghur, buckwheat groats (kasha), cornmeal, couscous, grits, millet, oats, popcorn, quinoa, rice (arborio, brown, white). Note: Transfer packaged or bulk grains to glass jars with tight-fitting lids for storage: it’s easier to see how much you have on hand and helps protect your grains from insects. Milled grains, like flours and meals, have a shorter shelf life than whole grains, so unless you use them up within a month, they should be refrigerated or frozen in closed containers. Dried – Black turtle beans, black-eyed peas, chick peas, red kidney beans, cannellini (white beans), lentils (red, brown), limas, navy or pea beans, pintos, split peas (green, yellow). Canned – Butter beans, black beans, chick peas, kidney beans, cannellini. Note: When buying dried beans, look for those with uncracked shiny coats and good color. Red the labels on canned beans. Some are sodium-free, some are organic, some have additives and preservatives. Asian – Rice noodles, soba noodles, udon noodles. Italian – Spaghetti, linguine, penne, ziti, farfalle, orzo, lasagna noodles. Note: Dried pasta, if stored in a well-sealed container, can last a lifetime, so stock a range of shapes and sizes: tiny pasta to add to soups and stews, chunky pasta to toss with vegetables, and long noodles for saucing. Almonds, cashews, hazelnuts (filberts), peanuts, pecans, pine nuts, walnuts, sesame seeds, poppy seeds, sunflower seeds, tahini, peanut butter. Note: Nuts and seeds are terrific to have on hand for cooking, snacking, and for quick, nutritious additions to cereal, yogurt, and fruit salads. I possible, buy them in bulk, since the tend to be expensive. Check that they are crunchy, smell fresh, and have good color and sheen. Always store refrigerated. Canola, olive (regular and extra-virgin), dark sesame oil. Note: Experiment with different brands because the flavor varies. Oils that are used often can be stored in dark bottles or in a closed cupboard. Oils that are used less frequently should be stored in the refrigerator. Allspice, annatto (achiote), basil, bay leaves, black pepper, cardamom, cayenne, caraway, coriander seed, cinnamon (ground and stick), cloves, cumin seed, curry powder, dill, fennel seed, five-spice powder, garam masala, marjoram, mint, mustard seed, nutmeg, Old Bay Seasoning, oregano, paprika, rosemary, saffron, sage, tarragon, thyme, turmeric. Note: An extensive spice collection is a real asset. Is there anything more frustrating than having everything you need for a recipe except one pesky herb or spice? since the flavor and fragrance of herbs and spices fade over time, buy in small quantities or store refrigerated in well-sealed containers. For best flavor, purchase them whole and grind them as needed. Chinese chili paste, chinese fermented black beans, fermented black bean sauce, fish sauce (nuoc mam), fruit spreads, hoisin sauce, mustard (Dijon, spicy brown, yellow), soy sauce, hot sauce, vinegars (apple cider, red wine, balsamic, rice wine), wasabi powder. Note: Condiments add depth, heat, pungency, flavor, and complexity and can make a so-so dish suddenly delicious. Those that contain fresh ingredients, oil, or high percentages of sugar or other sweeteners should be refrigerated. Artichoke hearts, capers, coconut mik (unsweetened), olives (Spanish, kalamata, black), pinientos, roasted red peppers, chipotle peppers in adobo sauce, salsa, tomato juice, tomato paste, whole tomatoes, tomato sauce, clams, clam juice. Note: Read the labels and experiment with different brands to find your favorites. I think canned goods that are free of additives and preservatives taste best. Chinese rice wine, dry red and white wines, liqueurs (amaretto, Grand Marnier, Frangelico), Marsala, mirin, sake, sherry. Note: Sometimes a splash of wine or liqueur can add the perfect touch to a dish. If not used regularly, store them in the refrigerator. Black-eyed peas, lima beans, peas, corn, okra, puff pastry, filo dough, tortillas (wheat, corn) tempeh. Note: Keep frozen foods well wrapped to avoid freezer burn. Dried fruits (raisins, currants, apricots, dates, figs, dried cherries) – Store refrigerated in a closed container, if not using quickly. Fresh Garlic – Store in a vented jar. Sun-Dried Tomatoes – Store in a closed container or plastic wrap in the refrigerator. 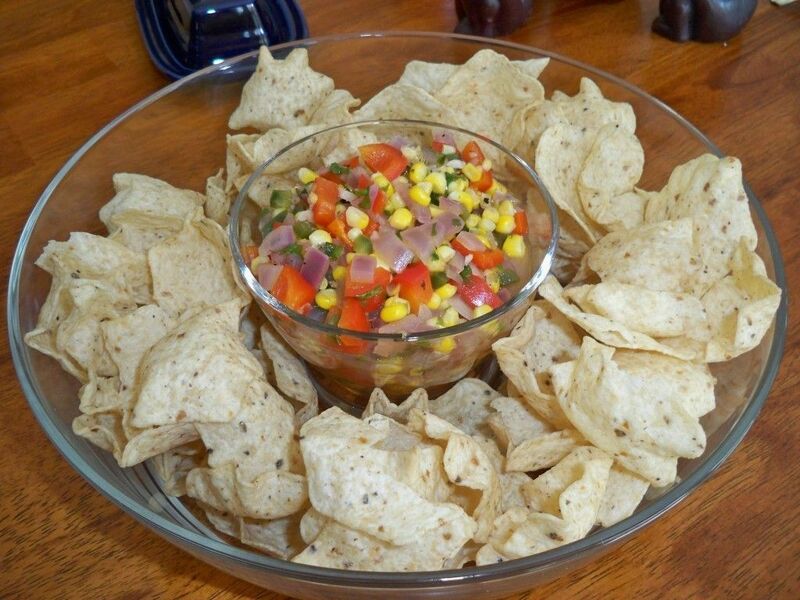 This Texas Caviar recipe came from my mother in law and is a favorite among company. This is a version of salsa that is tasty and filling. It is loaded with fiber and protein, which also makes it balanced. Black-eyed peas, also called cowpeas or crowder peas are a pale-colored dry bean, with a black spot that gives them their name. Black-eyed peas are an excellent source of calcium, vitamin A and folate. They are low in fat and sodium and contain no cholesterol. The grilled corn adds a really nice and subtle smoky flavor to the Texas Caviar. Serve it with baked tortilla chips or pita chips for a low-fat option.